Is it fair if you hold a player on defense while the ref isn’t looking? Our Jr. NBA partner Positive Coaching Alliance (PCA) does not consider that fair. But it is a good question to ask, and one of the things that is so great about sports is that it can get people talking about what is right and wrong. Players will start on the baseline without a ball. The coach will say “Go!” and the players will start running around the gym in any direction. The coach will then say either “2 Feet!” “Left Foot!” or “Right Foot!” to indicate how the players should stop. The players will then stop in the manner in which coach has commanded and hold that position. Stopping should be very quick and work on balance. Repeat the process for 3 minutes. The players will start by dribbling the basketball with the right hand low in a good stance with their eyes up and using their left arm to protect the ball. The players will do this for 20 seconds and then switch to their left hand and complete the same process. 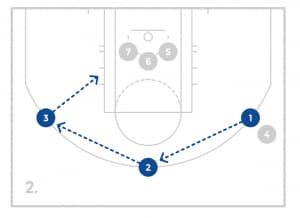 Next the player will move back to their right hand and dribble at the middle level for 20 seconds and then switch hands. 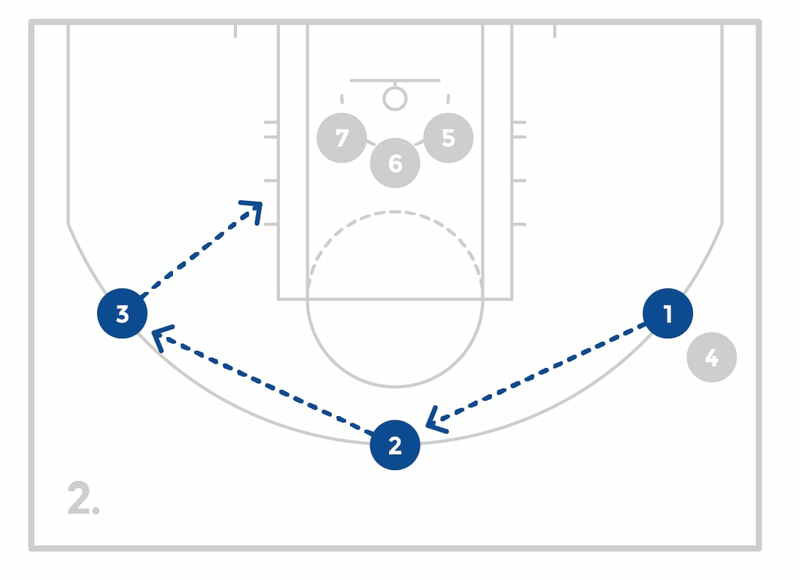 Last, the players will dribble the ball high, around shoulder level for 20 seconds each hand. 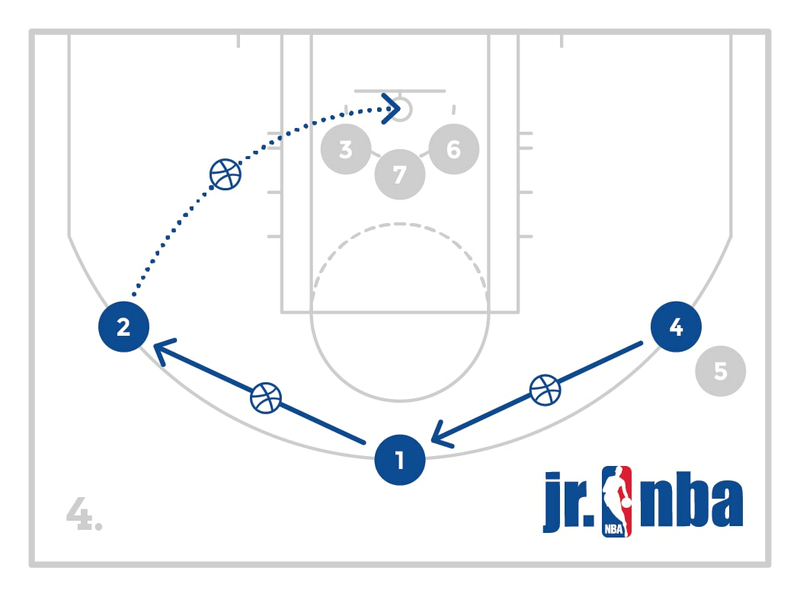 Throughout this drill, the coach will hold up a variety of numbers of fingers. The players must see the fingers and call out the number. Keep the players in a good stance with their chest and eyes up. Remind them to use their fingertips and execute low, middle, and high quick dribbles to improve coordination and ball control. 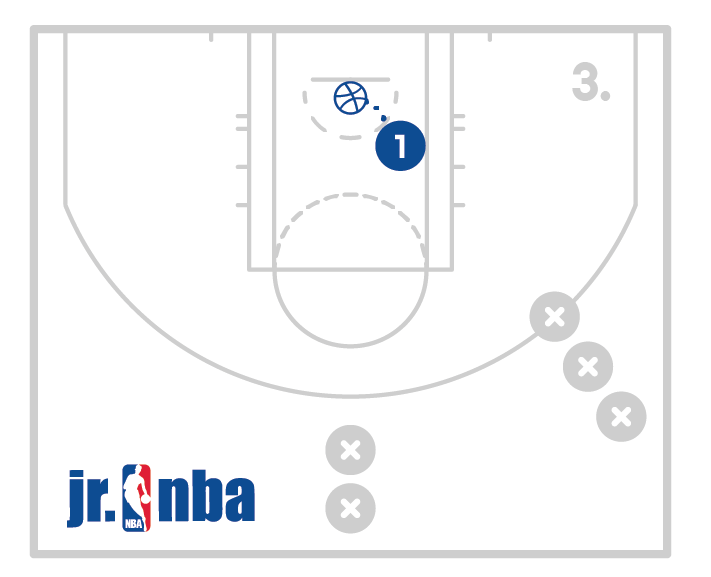 Have players partner up, get a basketball and line up about 10 feet apart. Based on the fundamental passing skills and wall passing previously taught, have the players now step and pass to their partner. 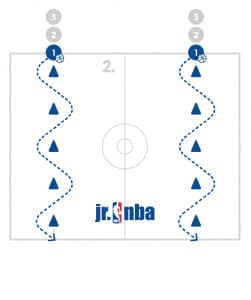 The 2 partners will make bounce passes to each other for 2 sets of 60 seconds and then do the same thing with chest passes. Ensure that the players make eye contact before passing and the receiver shows their hands as a target. 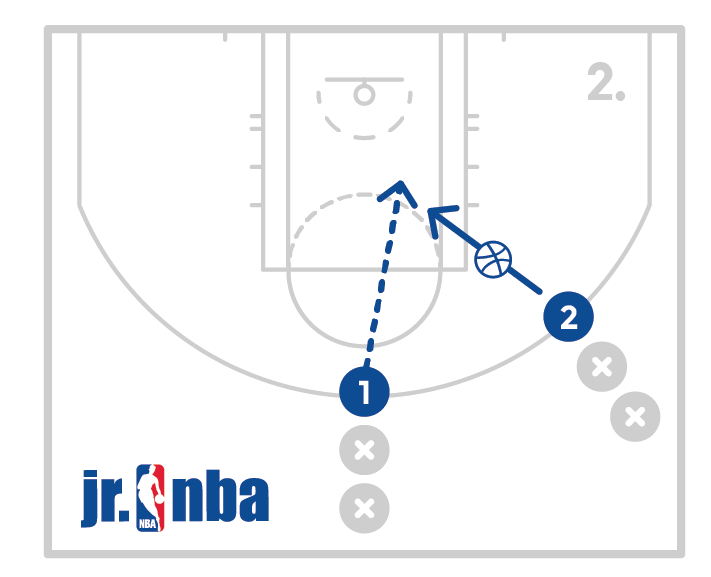 With a bounce pass, the pass will need to bounce more than half way to the teammate. The players should take a big step towards their partner, extend their elbows and snap their down to make a good pass. 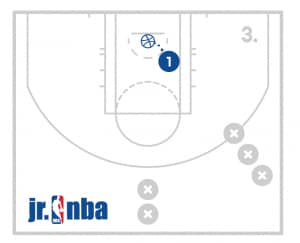 Have a line of players at the top of the key with a ball and another line of players on the wing without a ball. The player at the top will pass the ball to the wing player. 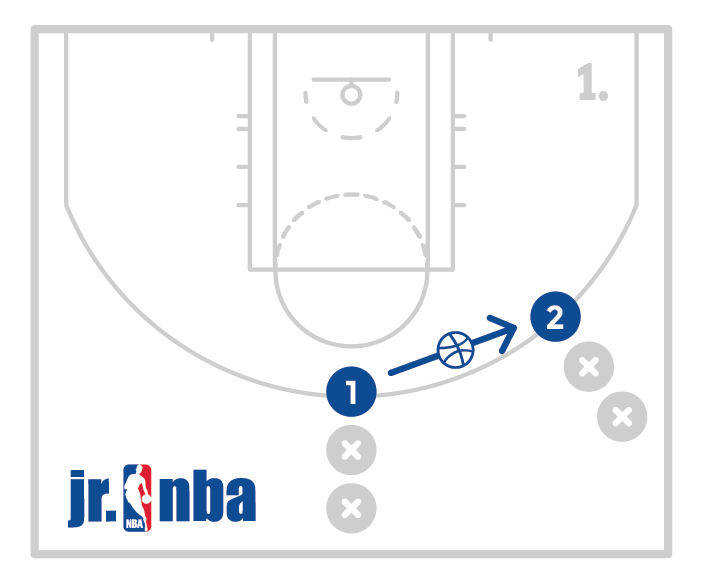 The player at the top will then run/cut to the basket and the player on the wing pass the ball to the player as they cut to the basket for a lay-up. The players will switch lines and continue. 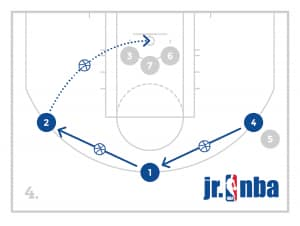 Divide the groups further and have another group on the opposite wing and another line at the top to get more reps. Also use other baskets if available. Have the players make good passes hitting the other players in the hands. Also ensure the players are cutting hard and making their lay-ups. Coaches can add light defense to make the drill feel more game like if needed. Have the players hold a ball and stand in a good stance on the baseline. After 4 pivots they should be facing forward again. Have them relax and then repeat the drill using the other foot as their pivot foot. 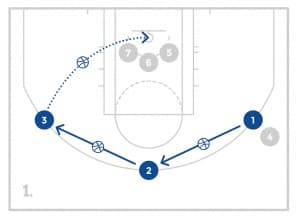 Help the players understand the basics of pivoting while gaining comfort, confidence, and balance while pivoting. Ensure players stay in a good stance while pivoting. Players are separated into 2 even teams and go to 2 designated spots at a basket (the wings, elbows, corners etc). There should be a line of cones equal to the number of players on each team that lines up next to the team. 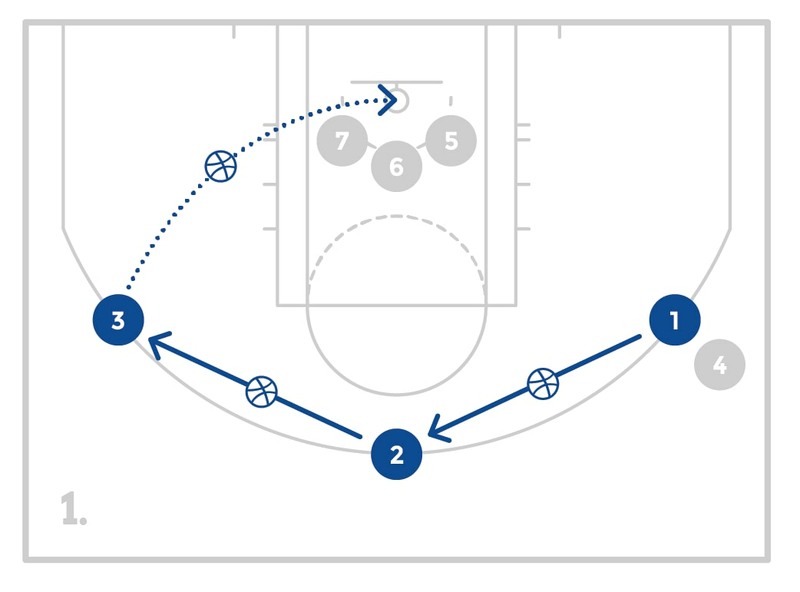 The first player from each line will shoot the basketball get their rebound and pass to the next person on their team. 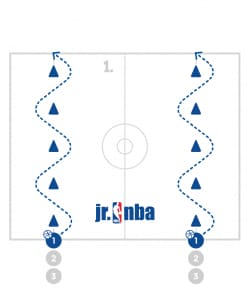 If the player makes the shot, they will take a cone from the other team and put it in their line of cones and move to the back of the line. 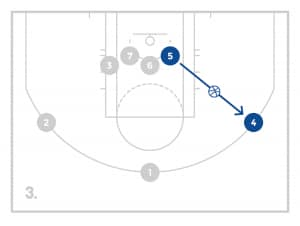 If the player misses the shot, they will get the rebound and pass to the next person on their team and continue to the back of the line without getting a cone from the other team. After 3 minutes, the team with the most cones wins. Also known as swinging the ball, reversing the ball is used to describe passing the ball from one side of the court to the other. When done quickly, it often provides the offense with an advantage as the defense tries to react.